← What’s In A Thought? 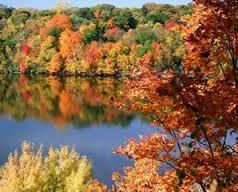 Here in the Mid-Atlantic, Autumn is marked by a spectacular palette of the changing leaf colors. The shortened daylight adds a vivid touch to the final quarter of the year. Below is one of my favorite representations. For me the Autumn symbolizes nostalgia, passage of time, and reflection. Seasonal change varies by location. What does it remind you of? This entry was posted in inspiration, transition, weather and tagged blogging, daily writing, potomac river run. Bookmark the permalink.